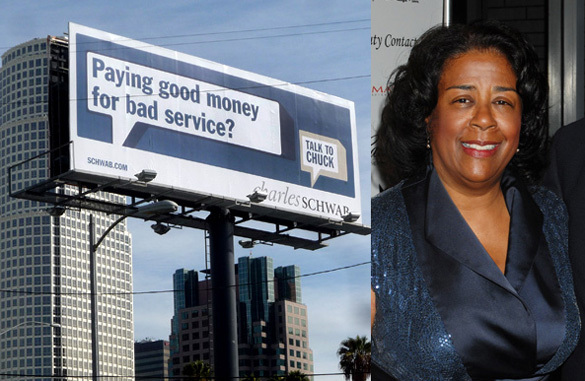 » Does Jan Perry Think Wilshire Grand Should Get Sign Credits For Removing “Illegal” Billboards? Does Jan Perry Think Wilshire Grand Should Get Sign Credits For Removing “Illegal” Billboards? At a March 1 meeting of the L.A. City Council’s Planning and Land Use Management (PLUM) committee, councilwoman Jan Perry told members that a sign district proposed for the $1 billion-plus Wilshire Grand project would require the takedown of “illegal” signs in exchange for almost 30,000 sq. ft. of electronic advertising signage on the building’s façade. Perry, a candidate for Mayor in the 2013 city election, didn’t elaborate on what type of illegal signs would be involved, or where they are located. There are no billboards of any kind currently on the site, entirely taken up by the existing Wilshire Grand Hotel. However, allowing credits for the takedown of illegal signs would be a radical departure from past practice, in which the city has required that any such takedowns be of legally permitted billboards. Perry appeared at two consecutive meetings of the PLUM committee to push for approval of the mixed-use office, hotel, and retail project, which would replace the existing hotel with a block-sized base with two towers, 65 and 45 stories, respectively. Large areas of the facade of the 150 ft. high base would feature embedded electronic lighting that would display off-site advertising. City planners recommended that the project be allowed three square feet of signage for every square foot of off-site signage taken down in the area. Planners also recommended limiting the signage to slightly more than 6,000 square feet, but the PLUM committee approved almost five times that amount, which would require the takedown of approximately 15 full-sized billboards, or the equivalent. In the Hollywood sign district established in 2004, developers were allowed four square feet of supergraphic signage for every square foot of billboard display surface removed. However, before receiving that credit, developers had to submit proof that the billboards had valid sign permits. Because new supergraphic signs are now banned in the Hollywood sign district, that takedown provision is no longer applicable. In speaking to the PLUM committee, Perry referred to amendments to the sign district proposed for the Wilshire Grand project. “A takedown provision of illegal signs was mandated for the placement of any off-site signage,” she said. Perry, who urged the committee to overturn the City Planning Commission’s approval of the signage amounts recommended by the planning department, also assured members that the signage should not be considered another form of billboard even though it would display ads for commercial products. “What is being proposed by the developer is not a billboard and it is not standard signage that has been seen in this city to date,” Perry said. The City Council last week approved an environmental impact report and series of entitlements needed by the project being developed by Hanjin International and Thomas Properties Group. A 20-year development agreement is scheduled to be voted on by the council on March 29.